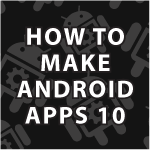 In this few parts of my Android tutorial I’ll focus on a Android Fragment Tutorial. I’ll start off slow here by showing you how to switch fragments based on screen orientation, which is very commonly used. I’ll specifically cover the basics of fragments, layout fragments, FragmentManager, FragmentTransaction, committing fragment replacements, LayoutInflator, Configuration and more. to use and where to put them based on screen size or orientation. It is also nice to use the same fragment on multiple activities. normally and as the screen size increases you can add more. Hi derek ,thanks for the tutorial , its really detailed good and even fun 🙂 even for people who are not english native speaker like me. A little basic question, is the procedure onCreate on myActivity is executed each time I change the orientation of my device? I understand fragmentTransaction is responsible for replacing fragments. However,the condition to replace a fragment (=what is our orientation) is checked in onCreate procedure. You’re very welcome 🙂 Yes onCreate is called every time the Activity has to be re-drawn to the screen. O love your code comments, it helps me a lot. Thanks for tutorial. It really helped me a lot . But i am not sure about one thing. Can you please tell me what is activity_my.xml for? It is not used anywhere and i deleted it from my app and everything worked just perfect. Thank you for your answer. Hi Daniel, You’re very welcome 🙂 activity_my.xml is normally the default xml layout for the app. I kept it there for those people that used it because it is created by default. The support folder is not in my sdk directory structure. Am I missing a package to install from the SDK manager?